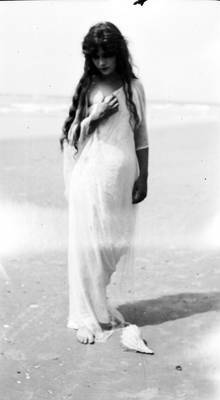 Production still featuring Florence LaBadie from the Thanhouser comedy “The Beauty in the Seashell” starring Florence LaBadie, Harry Benham, and Ethyle Cooke. Carl Louis Gregory was the director and cameraman for the third of the Thanhouser Cape May, New Jersey productions. Released October 19, 1913.